Purpose: Use this document as a reference for budget checking requisitions in ctcLink. 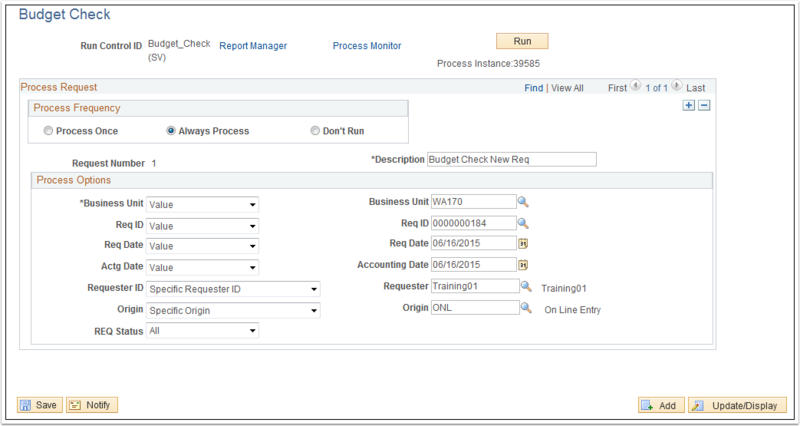 Budget checking can be accomplished one requisition at a time or in batch. The following instructions refer to the batch processing method and will budget check all requisitions in Approved status. 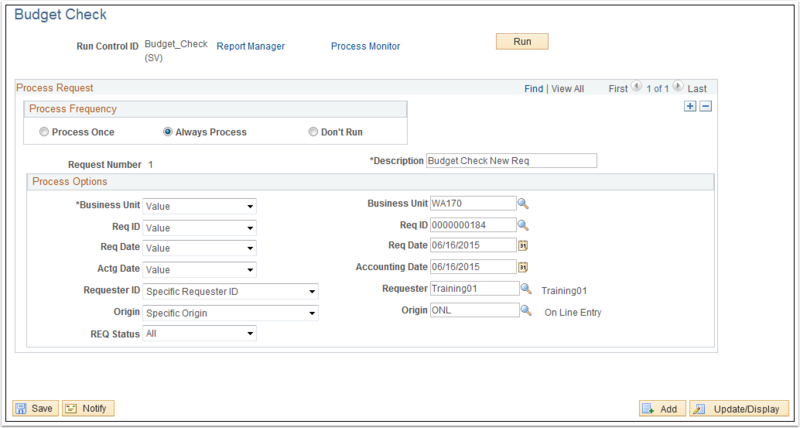 Refer to the Fundamentals QRG titled Running Reports, Jobs, and Queries for additional information about running jobs (generally) in ctcLink. 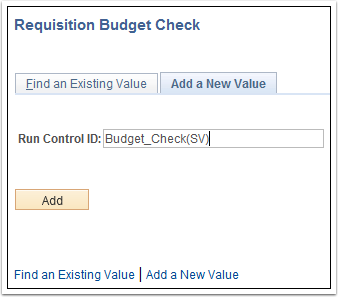 Enter an existing Run Control ID or click the Add a New Value tab on the Requisition Budget Check page to add a new value. Use the Budget Check page to enter the request parameters. These parameters will be used to define the processing rules and data to be included when the process is run. Additional fields can be used to narrow down the processes from ALL to a specific group of transactions or just one transaction. Click the Save button and then click Run. If applicable, use the Server Name drop-down button to select a processing server for the request. What's the purpose of the budget check - to check for available funds or check for a valid budget code? Usually we're more interested in having a valid code. It's the program or division's responsibility to manage their budget. The answer is both. Of course, it all depends on the level of budget control that is set. For example, Spokane has the control set in Operations at the lowest level. This means that any coding and any budget amount will pass budget checking. Tacoma has it set at the next level up. This means that coding must be valid, but having available budget does not matter. Grants/Projects/Contracts is set at the highest level for both colleges. This means that there must be valid coding and budget available to pass budget checking.